We just recently purchased a used car from the Honda dealer so I wanted to send our salesman a surprise thank you card. He happens to be a very nice guy and a member of our church. I thought Wryn Scooting By would be the perfect fit with the included sentiment and all. I added the "to say thanks" font on my computer when I printed out the digital image. In this next photo, hopefully you can see the glossy accents on the dog's goggles, the headlight and tail light, and in the centers of the flowers. 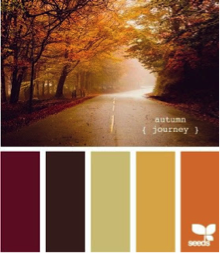 I can't wait to see how you are inspired by our Fall colors challenge theme. Don't forget to link up your card here and also share it on the Tiddly Inks Facebook page! Loving the colours you used. And those leaves too! Oh, my, this is so cute. I love it and you have colored it wonderfully. Thank you for joining us for the Classy Cards Challenge this week.